The soup is creamy in texture without using heavy cream. Potatoes and milk work together to give this soup a bright, classic flavor with less fat. The earthy, decadent flavor of mushrooms is on full display in this dish because both fresh and dried mushrooms are utilized in the preparation. By using just a splash of dry red wine to deglaze the pan even more flavor is infused into every spoonful. No one will believe you created such a dynamic dish in under 30 minutes! This vegetarian soup is a great way to use your pressure cooker for an elegant and light weeknight meal. Select Sauté program on pressure cooker to preheat the base; add olive oil. Sauté sliced mushrooms until golden on both sides, 3 to 5 minutes; remove to a plate. Push vegetables to the side of the pot. Add enough chopped mushrooms to cover the base of the pressure cooker; cook, stirring occasionally, until browned, about 5 minutes. Pour in the wine to deglaze the pan, lifting the browned bits of food from the base of the cooker with the flat edge of a wooden spoon; cook until the wine evaporates completely, about 5 minutes. Add remaining chopped fresh mushroom, vegetable stock, potatoes, wine, dried mushrooms, and salt; mix well. Close lid and set valve to Sealing. Press Pressure Cook and adjust cooking time to 5 minutes at High Pressure. When cooking time is up, slowly release pressure through the Quick Release valve. Mix in the milk and pepper. Pureé the contents of the pot with an immersion blender until smooth. Stir in most of the sauteéd mushrooms. Garnish portions with reserved mushrooms to serve. White, Crimini, or Portobello mushrooms are ideal for this recipe, but use your favorite fresh varieties to make this soup recipe your own. Per Serving: 238 calories; 4g fat; 44.1g carbohydrates; 8g protein; 4mg cholesterol; 670mg sodium. This soup was fairly creamy for not having any heavy cream in it. I had forgotten the red wine, but I had a porcini mushroom bouillon cube and made a broth from it in place of the wine. Great healthy soup! I made this soup and it was delicious. Even though it's low in fat, it's really rich in flavor! I love being able to cut the calories, but still enjoy the taste. 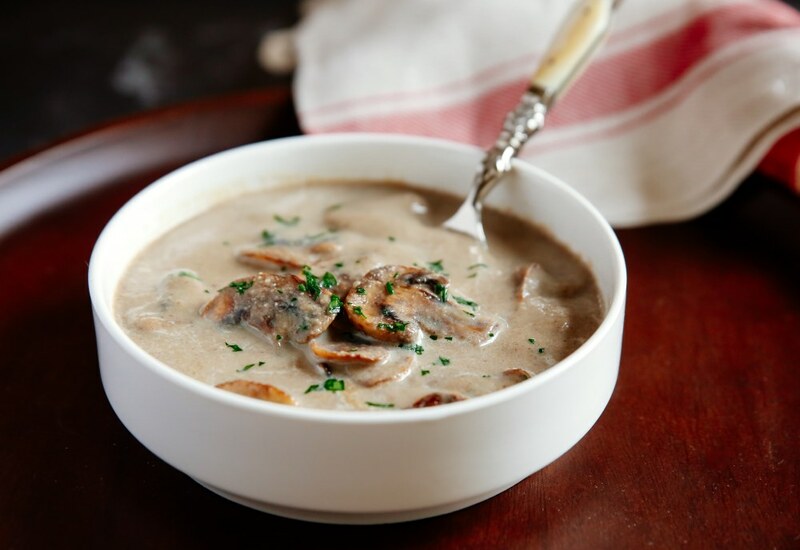 If you like traditional cream of mushroom, you must try this healthier version! I loved it and will definitely make again. I really like cream of mushroom soup but not all the calories that come with it. This version was delicious, creamy, and much healthier than the traditional recipe. I used a mix of wild mushrooms and was very impressed overall with the way it turned out. I can’t believe how much better this tastes compared to canned. Made it for a lunch, but would definitely consider making a large batch to freeze for use when recipes call for canned cream of mushroom soup. I suppose the better mushrooms go a long way in improving the flavor. The pressure cooker seems to help the dried mushrooms get nice and tender while maintaining the intensity of the flavors. All-around a real winner of a recipe. I used half and half instead of milk and skipped the dry red wine deglaze (didn't have any), so I just deglazed the pan with stock. Recipe still turned out great! My family enjoyed this soup. What I would different next time is less black pepper. But it’s just me and my personal preferences. This is great recipe. Really the best mushroom soup I’ve ever tried. My family loved it. I’m going to do it again for sure.